Gluttony and greed – two of the seven deadly sins. Bad, very bad. The Bible says so. But, at the end of a meal at the aptly named Syn, you can’t help but admit that you’re a ‘synner’ yourself, and the only thing that will cross your mind is how GOOD it was! Everything about Syn at Taj Deccan in Hyderabad exudes a calm yet forceful elegance- the uncluttered decor, the seating and even the island bars. 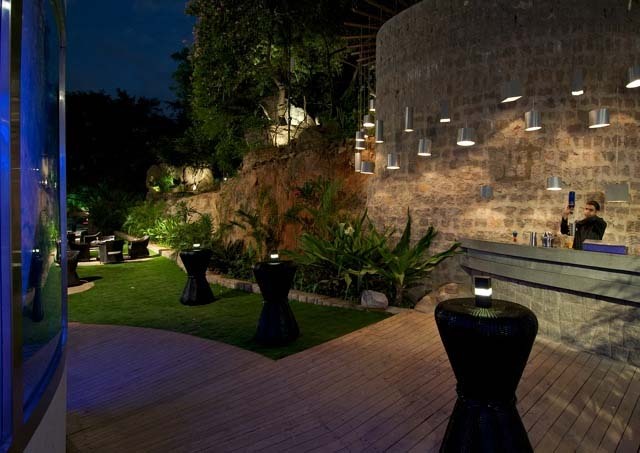 The outdoor ‘Synfresco’ is aesthetically done as well, with sun umbrellas shading comfy cane sofas on a pebbled ground. Surrounded by just the right number of trees, and the well kept rock garden; it’s the perfect place for a long, lazy Sunday brunch. But Syn can be so much more than just that. From an airy and elegant restaurant in the day, the evenings see a transformed Syn doubling as a lounge bar as well. Ambient lighting and a rocking DJ console is all it takes to alter it into what is the current ‘it’ place on the Hyderabad party circuit! Syn trumps the list in terms of food as well. With a menu that includes the finest Japanese, Vietnamese and Thai dishes, it is one of a kind when it comes to oriental cuisine restaurants in Hyderabad. 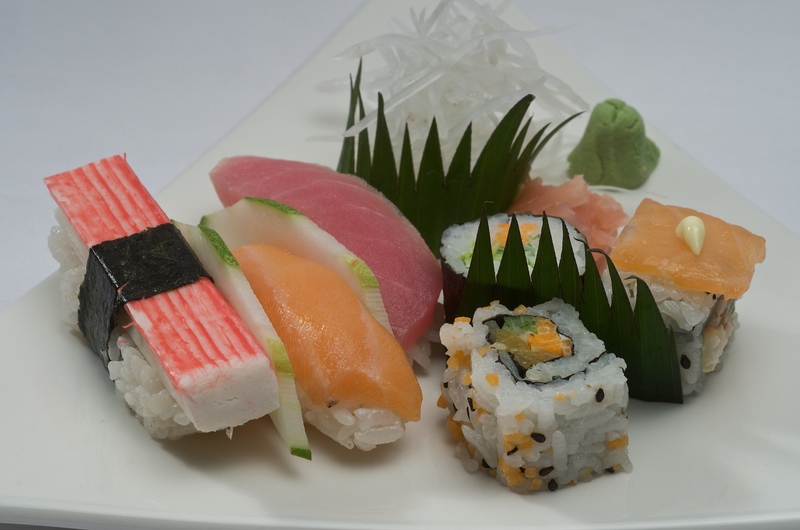 Their popular sushi menu offers sufficient options in nigiri sushi, maki rolls and vegetarian sushi, which can be ordered around the inter-active sushi bar. And you can even order yourself some sake to make the experience more authentic! What is perhaps most interesting about Syn’s food menu though, is not the impeccable sushi, but rather the teppanyaki. Derived from ‘teppan’ which means iron plate, and ‘yaki’ meaning grilled, broiled or pan-fried, teppanyaki is a Japanese concept that refers to dishes that are cooked on an iron griddle. 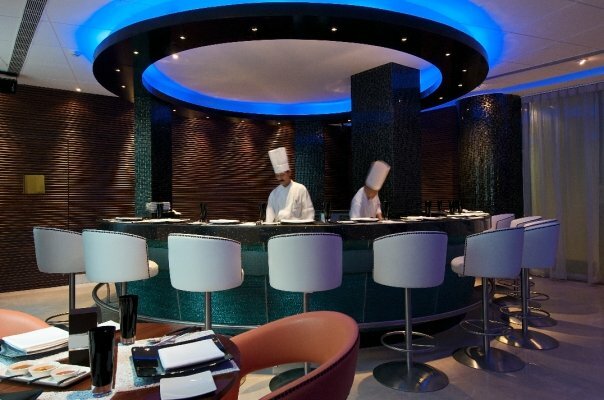 And living up to its 5-star status, the teppanyaki chefs at Syn are trained in traditional manoeuvres, so you always have the option of sitting around the teppanyaki bar and getting a front row seat as the chef whips up your meal. The teppanyaki menu gives you a lot of choices – a range of vegetables, niku (meat) like chicken and lamb chops, or seafood – fish, scallops, prawns and lobster. Just decide on the sauce you would like and the chef will do the rest! The well-trained and knowledgeable staff are always there to offer suggestions if you need any. For fish lovers, the Norwegian Salmon is a great choice – a perfectly filleted slice of salmon, beside a mound of rice infused with Asian spices, and sautéed vegetables. Synful! The rest of the menu sounds as sumptuous as the sushi and teppanyaki, with delectable treasures such as the ebi tempura, satay-kai, foie gras, Thai roast duck, braised turkey breast, Thai curries and Vietnamese rice-paper rolls. 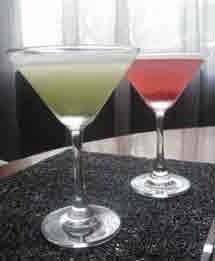 What the restaurant has also become known for are the Syntinis – an interesting and inventive range of Martinis like the Wasatini (Wasabi + Vodka), Peppappletini and Esprestini (Espresso + Vodka), most infused with delicate Asian elements like basil, lemon grass and others, in keeping with the cuisine. There are also the Detox cocktails which use fresh carrot juice, coconut water and green tea as bases. Anyone up for a ‘healthy cocktail’? Or if you can’t decide, just opt for the Drink of the Day– there’s something new every day! But that’s not all. A single Glass-o-Syn is outdone, and brilliantly so by the Jar-o-Syn, that allows up to 10 people to sip out of the massive glass with huge straws. The intent? To promote community drinking. ‘Community drinking?’ you ask, with a raised brow. Well, why would you expect any less from a place called Syn! So, 5-star ambience – Check. 5-star food – Check. 5-star cocktails – Check. 5-star prices – umm…….. Going by the look and location (Taj) of it, you would expect the prices at Syn to be relatively high, if not exorbitant. But this is where Syn packs in another little surprise. And a welcome one at that! The bar menu has extremely affordable prices. Perhaps the best way to rate it would be by taking into consideration the price of a single pint of Kingfisher and a classic cocktail like a mojito. At Rs. 155 and Rs. 275 respectively, the alcohol here is more reasonably priced than at the average 5-star. But don’t let the price give you the wrong impression. The Syn bar is well stocked with all the premium alcohol brands that you could hope for. And along with the wide range of aperitifs and single malts, the wine list too is pretty impressive, with a fine selection of international brands as well as the popular Indian ones. There is also a special Unlimited Syn lunch menu through the week, which offers sushi like California Maki (sushi with crab stick or or sea food filling), Amai Shitaake Maki (sushi with shitake mushrooms), deep-fried water chestnuts tossed in plum sauce and Thai curry with Thai noodles and rice. And for desert… Synful Chocolate (as awesome as it sounds!) and Makroot Cream and ice cream. At just Rs. 456 plus taxes per head, it definitely gives you more than your money’s worth. Ever since its launch late last year, Syn has maintained its young and fresh quality by constantly organising fun events or hosting lively interactive nights like ‘Be-a-bartender’ night, ‘Friday Dedications’ or ‘Live Tuesdays’. And this is an important reason why Syn gets the best of both worlds when it comes to guests. From those with a penchant for exquisite oriental cuisine, to the corporate bunch wanting a nice chilled beer at the end of the day, to the party-goers looking for a fun night out – there’s something to please everyone, and Syn will make you want to keep going back there. Then again, sin has always been tempting, hasn’t it?